Cllr Allan Haskins, chair of LLANLLAWDDOG Community Council in Carmarthenshire, recently received a cheque for £5,000 from Hans Bunting, chief operating officer of renewables at Innogy SE. This was the first grant to be awarded by the Brechfa Forest West Wind Farm Community Fund, and will go towards the provision of defibrillators in the community. The Brechfa Forest West wind farm started generating in January 2018 and was officially opened in August. It has an installed capacity of 57.4MW and can generate enough energy to meet the annual electricity needs of 38,800 homes, according to the company. It was named Renewable Energy Project of the Year at the Business Green Leaders Awards, and will help deliver on the Welsh Government’s target of 70 percent of the country’s electricity being generated from renewables by 2030. 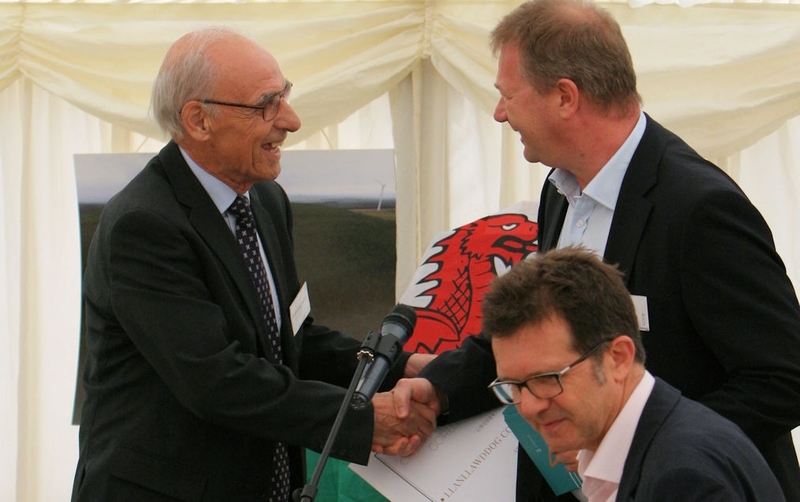 The community fund was established by Innogy Renewables UK Limited and is administered by Antur Teifi. It will invest £459,200 each year in the neighbouring area, or £11 million over the project’s expected 25 years of operation. A community councillor who failed to declare a £25,000 payment from an energy fi rm before a vote on its plans for a wind farm has been suspended for three months by an adjudication panel. Cllr Haulwen Lewis, of LLANFI HANGEL-AR-ARTH Community Council in Carmarthenshire, received the payment from RWE NPower Renewables Ltd, but failed to mention this “prejudicial interest” at a planning vote on the company’s proposed Brechfa Forest West Wind Farm. Cllr Lewis and her husband John agreed to let RWE build an access road on their farmland in return for the £25,000, with the promise of a further £30,000 if the plan went ahead. The project, which consists of a dozen wind turbines, has since been approved, though construction is yet to start. Cllr Lewis attended a council meeting and secret ballot in January 2012 but failed to disclose the deal. The Public Services Ombudsman for Wales received a complaint in December 2013, which led to a hearing of the Adjudication Panel for Wales in Carmarthen in August this year. The panel judged that she had committed a “serious” breach of the council’s code of conduct, and noted that she had only admitted it a day before the hearing. Cllr Lewis claimed that she abstained in the vote, with her ballot paper left blank. She will remain suspended from the community council until November. The Coalition’s anti-wind faction are now very much in the ascendant. Their secret weapons are two reports that Hayes has commissioned into the impact of wind power. One is a specialist study on the health effects of low frequency noise, to be produced by the Royal Institute of Acoustics; the other is a survey on the broader effects of wind on the rural economy, taking in such matters as the effects of turbines on property values and on the landscape. Both – provided they are conducted with rigour and integrity – are likely to strike a blow from which the wind industry can never recover. Not one of these alleged benefits stands up to scrutiny. Onshore wind mapping shows exponential growth in wind turbine planning applications leaving local communities struggling to safeguard valued landscapes . A new report by the Campaign to Protect Rural England (CPRE) highlights the dramatic proliferation of onshore wind turbines. In many cases these are damaging valued landscapes and intruding into some of the most tranquil areas of England. CPRE is calling for a locally accountable, strategically planned approach to onshore wind development. Download a map showing wind farm locations superimposed with CPRE’s tranquillity map of England (http://bit.ly/K4g2OA) and wind farm locations with protected landscapes (http://bit.ly/I5dajN). The CPRE report: Generating light on landscape impacts: How to accommodate onshore wind while protecting the countryside makes a number of proposals for action. It refers to assurances given last year by former Secretary of State for Energy and Climate Change Chris Huhne that the Government would not ‘wantonly plant windfarms across the countryside at random’ or let the ‘market loose upon the countryside’. Yet many communities are now faced with what seems like an unending stream of applications . In Cornwall and Durham, at opposite ends of the country, it is widely felt that the capacity of the landscape to accommodate wind turbines without unacceptable damage has been exceeded. Cornwall currently has 94 operational turbines over 30 metres tall with a further 18 consented and 11 in planning. County Durham has 60 operational turbines, 27 under construction, 19 consented and six in planning . In other locations the number of onshore wind farm applications currently in the planning system, if built, could mean that the landscape capacity of their area will also be exceeded. Northamptonshire, for example, currently has 13 operational turbines over 30 metres high, and an additional 46 consented and 32 in planning. Northumberland has 29 operational turbines over 30 metres high and an additional 24 under construction, 64 consented and one in planning . Research indicates that some wind energy developers enter the planning process with a dismissive mindset towards public concerns, seeking to disparage arguments against new development as baseless and emotional rather than well-reasoned and legitimate . In 2008 CPRE compiled a large body of evidence about the approach by wind energy developers which undermines the integrity of the planning system . The Regional Spatial Strategies, revoked through the Localism Act 2011, often used landscape character assessments to help work out what areas were suitable for renewable energy. These helped to outline a landscape-sensitive distribution of onshore wind across a region. Following the abolition of regional planning CPRE is calling on the Government to develop a strategic, plan-led approach which recognises the importance of landscape capacity, including the cumulative impacts of onshore wind turbines. provide national obligations for the onshore wind industry to take legal and financial responsibility for decommissioning onshore wind turbines and restoring the landscape once they stop working or when they reach the end of their useful life. As published in Local Councils Update, June 2012. In the January 2012 issue, we reported the recent comments of Prince Philip, Duke of Edinburgh, who declared that onshore wind farms were “useless” and that their supporters believed in a “fairy tale”. We asked for your views – and got a passionate response. As published in Clerks & Councils Direct, March 2012. PRINCE Philip is to be applauded for his comments about onshore wind farms. As a member of a parish council which has been directly facing the prospect of having a wind farm thrust upon them, I feel that I can offer an informed and objective view. Renewable energy is a principle that the vast majority of people support, but how it is achieved effectively is another matter. The Government appears to be obsessed with numbers: a commitment to have a certain percentage of electricity generating capacity from renewable sources by, say, 2020 and the easiest way of achieving this is to put up large numbers of wind turbines at a huge unsustainable cost to the consumer. The main point missed is that onshore turbines do not run at full rated capacity for much of the time due to the variations in wind speed. The irony of this is that a conventional power station has to run to cover the shortfall. A possible solution would be to cover the whole island with wind turbines and pray that somewhere the wind would be blowing and hope the lights stay on. Visual impact is a major concern of a lot of country-loving people. No-one I’ve spoken to has felt that having a wind farm built in open countryside would enhance its natural beauty or bring in more tourists – quite the opposite. Noise from wind turbines is a real and unpleasant condition experienced by some people living near them. Sadly their protests go unheard by the power companies and even local authorities do not appear to understand the problem. Property values certainly are affected by having wind farms built nearby. Damage is caused by construction; long-term scarring can be seen at wind farm sites many years old. There are also the environmental effects of the construction of access roads and the burial of large amounts of concrete for the bases. Wildlife is threatened by having large rotating machines in open countryside. Far from wind farms being seen as a useful tool to educate the next generation, they may well become a legacy of wasted resources and opportunity, deflecting attention away from true and sustainable renewable energy projects such as hydro, tidal or biomass. Wind energy supporters often claim that they can replace nuclear power stations with wind farms; this is another misconception. THE Duke of Edinburgh is wrong in saying that wind farms are useless: an average wind farm returns 20–25 times the amount of energy expended in installation and running the farm. There were also some erroneous statements in your article. Regarding unsaleable properties, surveys show that that there is either no impact (or a marginal impact: 2 per cent) on house prices once a wind farm has been installed and is up and running. There is more impact at the planning stage. The alleged £100 subsidy from each household is also incorrect. Regarding “defacement of the countryside”, this is a subjective view. I welcome the sight of turbines in the landscape and they are attractive compared with, say, pylons. It gives me hope that at last there is a shift to renewables starting to take place, thus ensuring our present way of life will continue once fossils fuels are exhausted. Your statement that wind turbines cause “the killing of thousands of birds” is also incorrect. A survey by Erickson and others in the USA found a figure of 0.01 per cent per 10,000 avian deaths caused by human activity. Wind farms have been built since the 1980s and the older wind farms suffered from lack of research into migration routes and the lattice type construction of the supporting columns. Technology and care with siting have improved dramatically. There is always a cost to the environment from any form of energy consumption. Oil leakage from wrecked tankers and the disaster in the Gulf of Mexico must have killed millions of birds and sea organisms. Incidentally, opinion surveys show that the general public is 80 per cent in favour of wind farms. This drops to 70 per cent where a wind farm is proposed in the vicinity. Those responding to the surveys believe that they are in a minority! Your invitation to a dialogue may expose some of the myths surrounding this subject and put forward a balanced viewpoint. As councillors asked to vote on these wind farms, we have a responsibility to future generations to act in the best interests of the country and on reliable and up-to-date information. THE following are the experiences of residents of our parish, Burton Agnes in the East Riding, after three years of living with the Lissett Wind Farm. Most notable is the noise issue. Although the developers Infinis (formerly Novera) have recently announced that turbines have been slowed down or stopped in adverse weather conditions, it has made no difference to noise levels experienced by nearby residents. Flicker is also an issue for some properties, as are red flashing aviation lights, although new technology is available to alleviate this problem. There has been a loss of TV reception, which is absolutely essential for residents living in rural areas. Freesat boxes were supplied by the developer to some residents, but these were the cheapest model and did not adequately replace existing systems or solve the problems that are still ongoing. House devaluation has also been reported and/or the inability to sell some properties at all. All of these problems were known by East Riding of Yorkshire Council (ERYC) before the planning application was approved. Most, if not all, of them are due to the fact that the turbines, at 850 metres, are too close to residences. A separation distance of at least 2km, as recommended in Scotland and Europe, should be applied to all planning applications. It is hoped that lessons will be learned from the Lissett Wind Farm, and that considerations for all future wind farm planning applications will take these into account. I am writing in response to your rather inflammatory article. Firstly, I would like to say that I am surprised at the amount of credence being given to the comments of the 90-year-old Prince Philip. I think before anyone can really pass comment on what approach the UK needs to take with its renewable energy strategy, you have to properly understand the predicament we are in with regard to our future energy security as well as climate change. I would strongly urge anyone interested in this complicated topic to first familiarise yourself with the UK Renewable Energy Strategy to understand what needs to be achieved. I would then suggest that you read Renewable Energy Without the Hot Air, by Professor David MacKay, Chief Scientific Advisor of the Department of Energy and Climate Change. This book explains why a mix of technology is needed, plus to what extent these technologies need to be deployed across the UK. It is very dangerous to pass judgment on any of this without fully understanding the above. In my mind, it has gone beyond aesthetics. We have wasted years debating where to site the various renewable technologies. I often wonder whether so much debating went into building the vast network of pylons across our countryside for the National Grid, or perhaps back then people’s need for electricity overshadowed aesthetics? Perhaps in the future, when we start to experience the inevitable energy shortages, people will start to welcome these technologies into their communities. I think the solution to winning people over is, where possible, to deploy this technology with community ownership. By sharing the benefits of energy generation through cooperatively owned systems, it will help alleviate some of the strong NIMBY feelings often encountered. A good book on this subject is Repowering Communities by Prashant Vaze and Stephen Tindale. I hope this is useful. It would be great to increase the levels of understanding within the local council community of England and Wales, rather than writing ill-informed articles. AS a resident of a semi-rural parish and responsible officer for a rural one, the blight of wind ‘farms’ is something that has been concerning our councillors and residents, as one village has been fighting off a development of wind turbines for some time. What residents and councillors would like to see are commonsense policies based on evidence-supported science, rather than being bilked out of our money and fed blatantly silly propaganda by self-appointed ‘experts’. The problems with wind turbines are myriad: their aesthetic is ugly, but this would be tolerable if they actually worked. Utter the words “wind farm” and you can watch property values plummet before your eyes. The construction of turbines and the link-ups to the National Grid cause more environmental damage than they will ever balance out and, because they do not work, you still have to have all the conventional infrastructure in place. Countries that have invested heavily in wind power, as in Scandinavia, have not closed a single conventional power station despite blighting their countrysides with ever more turbines. When they are in operation, turbines give off a faintly audible hum that is ‘felt’ as a vibration; this causes chronic insomnia and illness and makes life a misery for those unfortunates who live closest to them. The annoying lights on top are a problem at night, and people have no way to turn off either the lights or the maddening hum. Turbines also slaughter birds at a great rate. And of course, they destroy the beauty of any place they are situated in – the glorious view from Stirling Castle, for example. There is also, of course, the blatant way in which the taxpayer is treated like an idiot, because the wind farm industry would not exist if the huge subsidies were stopped, and we know we are being ripped off by a huge con trick. Renewable energy can work, if it is done properly. The UK is an island and our renewable energy should be water. The Ben Cruachan hydroelectric power station methodology is ideally suited to the UK, and we have two of the most powerful tidal bores in the world – the Severn and the Thames Estuary. Water power is far more reliable, can be designed to be much less ugly and conspicuous and, unlike wind power, can be designed to work better if there is more water going in, unlike turbines, which have to be turned off if it gets “too windy”! It is just as clean, just as green, and it actually works. I HAVE started a Government e-petition (Google “Petition 22958”) against onshore wind farms. I did this following my involvement in a campaign to stop a 285ft turbine being built in the midst of the beautiful, unspoilt and historical landscape of North Norfolk. I believe that the British public want to make the Government aware of their feelings and objections to these monstrosities. As with many other things, a lot of our elected representatives seem to be completely out of touch with the electorate on this issue. Many people are now concerned about the bigger picture: they are becoming aware that wind energy is a big scam and it is a way for companies/individuals to get rich quick. They also realise that wind turbines are highly subsidised by the taxpayer – expensive, inefficient machines promoted by central government to get the green vote and to meet the requirements imposed by the EU. They feel that it would be better to pursue tide and solar power, which is more predictable. Others are concerned about the social injustice and how the quality of their own lives will be affected. They are incensed that developers claim that none of their concerns are valid but are not prepared to offer compensation if their fears materialise. They feel that the developers’ new-found riches are at their expense. Most are concerned that this could be the thin end of the wedge and that the country will eventually be taken over, as has already occurred in parts of Scotland, by these machines and their infrastructure. This would ruin the landscape and affect the tourist industry, which is the lifeblood of many areas. The other sad thing is that wind power will never save the planet. Back-up power sources will always be required and any fuel saved will be used elsewhere. People also tend to forget that the money being wasted on this “green” dream could, as well as reducing electricity prices, be used in the health service, looking after the vulnerable; for affordable housing; reducing tuition fees for students; and in many other areas. AS a parish councillor living within sight of eight wind turbines, with possible plans for another 13, I strongly agree with the Duke of Edinburgh. Here in an AONB they are the most prominent feature for many miles. You ask what are our objections and the answer is all of those things mentioned, plus the intrusion of man into an otherwise very wild area. I see only a limited advantage, when they are used to supply energy to individual projects or industry. They then are a lot smaller and not nearly so intrusive. Here we have had a lot of discussion on the subject and although not everyone feels as I do, the great majority of those who bother to respond to meetings and questions agree with me. I am a parish councillor but write purely as an individual. I will make just six points. The beauty of the British countryside/landscape is a priceless asset that most seek to protect. Huge towers, pylons and rotating blades will greatly diminish that asset. Subsidies to pay for these eyesores are inflating all our electricity bills. When there is too much or too little wind, a 100 per cent back-up of alternative generating capacity is needed. The impact of British wind turbines on the global problem will be negligible. The delusion that the sacrifice of our countryside is worthwhile will distract attention from the pursuit of effective solutions worldwide.